Culms: Ascending, often sharply bent below, much-branched at base, hollow, glabrous, ring of glands below nodes. Blades: Flat to somewhat inward rolled, 2-10 inches long, less than 1/4 inch wide, light green to grayish green, glabrous below, rough above, wart-like glands on margins and often midribs. Sheaths: Shorter than internodes, glabrous, collar often with hairs. Ligules: Fringes of short hairs. Inflorescences: Panicles, dense, erect, 2-6 inches long, .5 to 3.5 inch wide, gray-green to tan; branches ascending, bearing spikelets nearly to bases. Spikelets: Numerous, oblong, .25 to .75 inch long, less than 1/6 inch wide, very flat, mostly 5-35-flowered; awns absent; glumes narrow, unequal, drop early; lemmas closely overlapping, tips rounded. Habitat: Waste areas, roadsides, lawns, and fields. Toxicity: It is thought to be poisonous to livestock (particularly horses) when grazed in large quantities. Cattle avoid it. 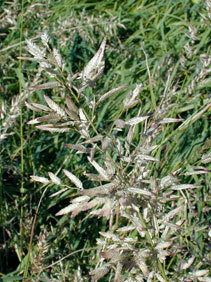 Forage Value: Stinkgrass is weedy and has only minimal forage value. Comments: Tufted. The common name alludes to the plant's unpleasant odor when stems and leaves are crushed. It tends to invade overgrazed pastures.